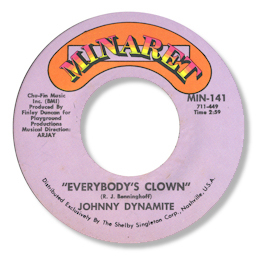 A long time personal favourite singer, Johnny Dynamite is one of those mysterious figures whom nobody seems to know anything about – but I can hope that by publicising his vocal talents here somebody might come out of the woodwork and tell us more about him. Even his real name is unknown – although I have a feeling it might be John Adams from writer credits on his singles – but I’m on rather steadier ground on his first 45. This was for the terminally obscure Format label which may well have been Phoenix, AR based. In any event Baby (Wish You Were Here) is a fine ballad, with a lovely flowing tempo and a careful vocal from Johnny following a well-constructed rap. 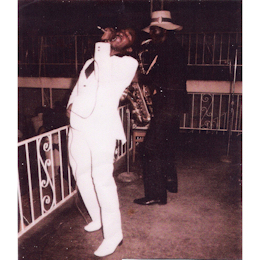 All his other recordings were made for Finley Duncan’s Valparaiso, FL concern Minaret. Only one 45 was ever issued and it couples a thumping version of “The Night The Angels Cried”, also recorded by that excellent blue eyed singer Len Wade for UA, with a quite exqusitie piece of deep soul Everybody’s Clown. The rhythm tracks for both sides of the 45 were cut in Muscle Shoals and as ever their sensitive and perceptive accompaniment does much to make “Clown” such a first rate track. But as always with music of this depth it is the voclas that really count and Johnny doesn’t disappoint in any way. 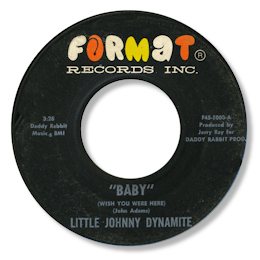 A couple of unissued Johnny Dynamite tracks have surfaced over the years. The Alabama recorded “Money Man” moves along pretty well without being anything special. “Blowing Kisses In The Wind” has more going for it – some nice tempo changes, fine horns and a fully committed performance from Mr Johnny. I wonder if any more cuts by this great singer will ever surface? I hope so. 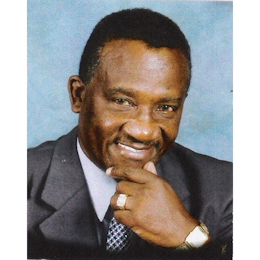 UPDATE ~ I have had the great pleasure of talking to Johnny Dynamite on the phone. “My name is John Henry Adams Jr,” he told me, “and I was born in Milton, Florida about 20 miles from Pensecola. I wsas always singing as a child and when I grew up I wanted to carry on. I had a little band and we would play around town doing clubs and this DJ from WBRS in Pensecola named Jerry Ray said to me that we should make a record. Well I never signed anything but he got a car and we all went up to Memphis – me and this white band the 13th Hour Glass. We cut “Baby (Wish You Were Here)” and “Midnite Hour” and this band they were backing me. We did get some plays on that tune in Florida but not much in any place else. So I wasn’t getting anywhere and one day a guy told me to go see Hank Loughlin. He was big with “Send Me The Pillow You Dream On”. Well I went round his place and he drove up in this big Eldorado Cadillac with a bale of hay in the back of it. He said I should go get in with some reputable people in the music business. He told me to go see Finley Duncan. I won’t say a word against Mr Duncan. He took me to Muscle Shoals to the Fame studios and we cut all those songs there. We got airplay on “Everybody’s Clown” at WLAC and in California too we got some good local sales too and the contract said we could do more songs so we went back to Alabama and cut some more. But they never came out. I don’t know why. I'm very grateful to Johnny for taking the time to talk to me - and I’m sure we all wish Mr Adams the best of luck with his new recordings. 1. Both sides of the Minaret 45 and "Money man" can be found on the Sundazed CD “South Side Of Soul Street” and “Blowing kisses in the wind” can be found on the download only selection “Playground Soul Vol 2”. 2. Thanks to Naoya Yamauch, Greg Burgess, Jeff Lemlich and particularly to Jim Lancaster who sent me the excellent pic and kindly gave me Johnny Dynamite's phone number.